924Board.org :: View topic - 1980 Porsche 924 Restoration - Finally Coming Together! 1980 Porsche 924 Restoration - Finally Coming Together! Yeah The composite resin filling materials are half aluminumsilicate, release formaldehyde for 4 months, and the bonding agents contain aluminum oxide as a buffer; often not listed in SDS. I'm highly allergic to aluminum and can't break down formaldehyde well; causes metabolic acidosis! Anyway, tons of formaldehyde exposure sources in our shops/cars. I encourage all of you to please take care! Open the shop up and get fresh air any day you can! Not good for any of us. Goldwolf, will PM you. Sounds like AAV is might be stuck mostly closed (gassing it on start bypasses that), but the fact it continues after it's warm might bring the WUR and other things into question. Maybe this chart will help you! If anything died in the OXS system, the car would run like it didn't have an EGR/emissions system. 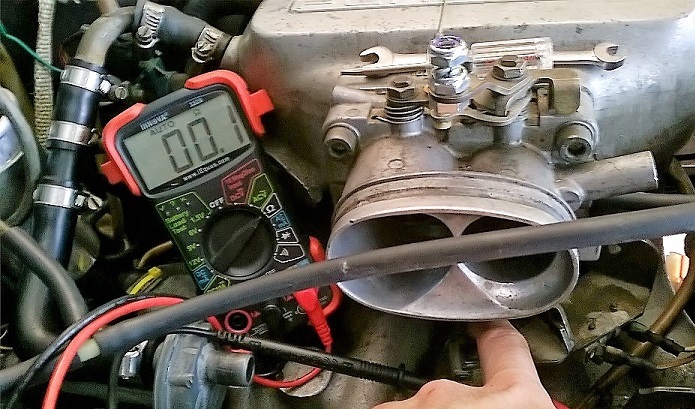 I noticed oil coming from the oil fill cap (thought the lid gasket might be worn) and poor oil control at the spark plugs, which is expected on a new motor; but it could also be non-vented gasses building up in the head? If components that trigger changes in the emissions system failed, it would cause mixture and idle issues. I have tons of documentation, but none explain the 1980 OXS well or its internal functionality. I pulled the OXS box. P/N's listed. The RPM relay metal seems very 'tin' like; it just seems abnormally 'beer can soft'. Not being able to test the OXS or RPM relay on the bench, I moved onto microswitches and found a problem. The idle microswitch is NOT fully closed at idle! 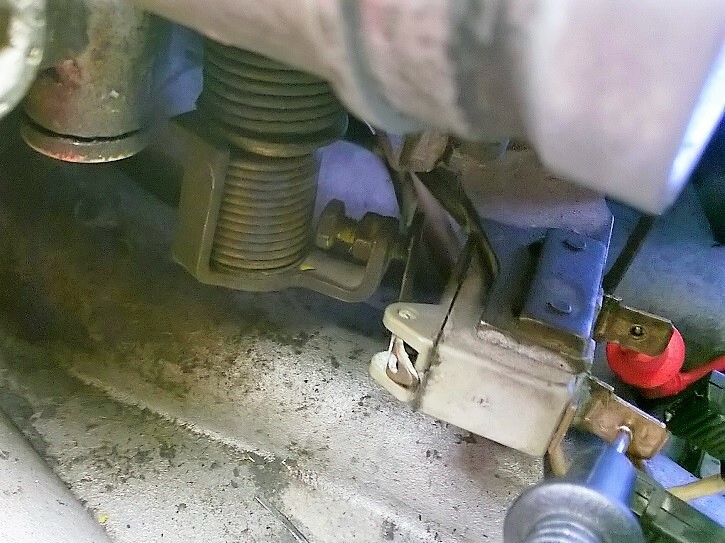 I unhooked the throttle linkage and moved the idle-rest to ensure that I hadn't caused it to do this when replacing the throttle wire linkage; still won't close the microswitch. Either way, the microswitch issue is a solid find and needs fixed. Starting there! The mechanical trip is touching the actuator, but it's not pressing it to complete the circuit. 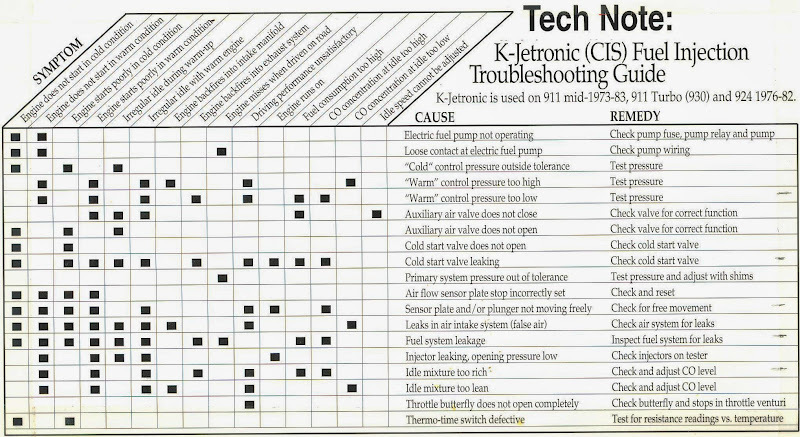 The full throttle switch functions, but adjustment is unknown. 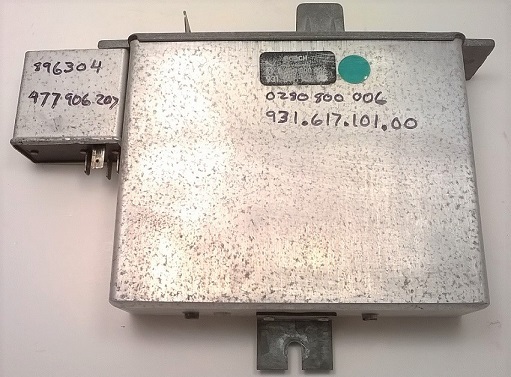 Switch actuators are worn Filled the cracks with JB weld; failed to withstand mechanical wear 24 hours after curing. Removed the JB. We cut tabs out of sheet metal and used steel epoxy to laminate them to the switch tabs. There's about 3mm of adjustment in the screws, which is plenty to accommodate an extra 1mm. I'm screwed and have to re-calibrate the switches for the OXS. Anyone have experience doing this? 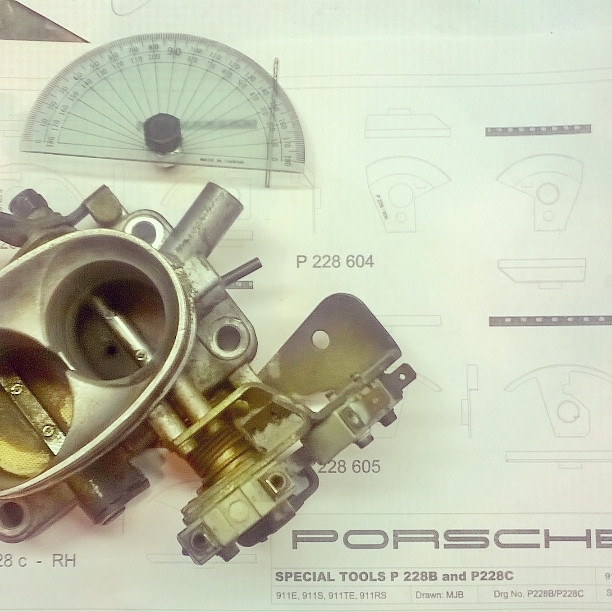 Shop manual calls for Porsche Specialty Tool P228B / P 228 604 Degree Dial that was 'made locally' to calibrate the trip positions. 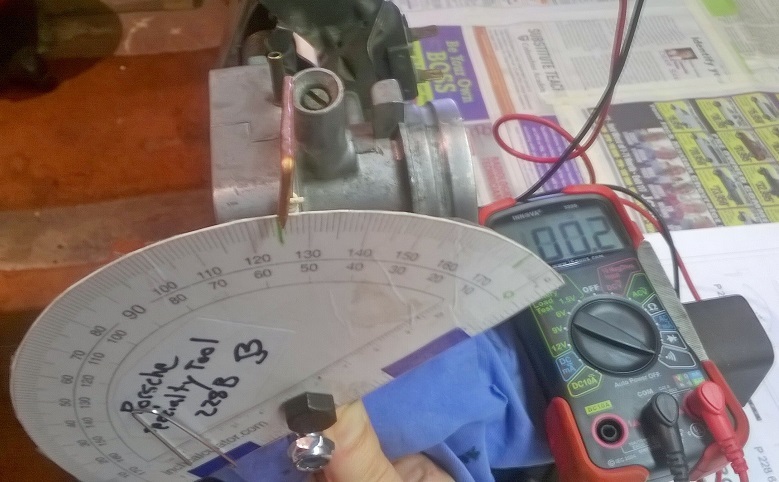 I found very little online, but re-engineered the calibration tool from the information I could collect and shop manual. Idle-rest is at min, plus a bit to ensure it engages the switch when tuning. I would think idle switch not closing would trigger a slightly rich state (assuming OXS works), not lean which I'm experiencing. The OXS box should think the throttle is in the 7+ degrees position, where both switches are open; unless OXS has an emergency mode of some sort? I could have the FD mixture slightly lean and this problem also exists. I need to get a an Innovate MTX-L Digital Wideband Air/Fuel Ratio Gauge Kit for this thing. Calibrated, assembled, and pending testing. 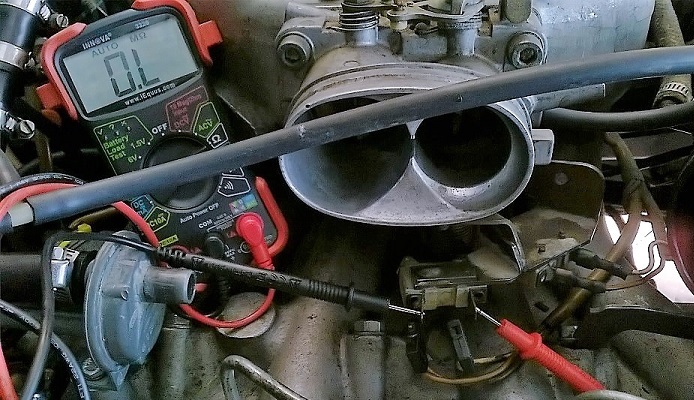 The idle stop creates interesting questions to calibration in terms of tuning. I set it a half degree rich and it should theoretically richen with wear as to prevent the development of a lean condition. I may write up instructions with photos if anyone is interested once tested. Microswitches are calibrated and installed; took about 30 minutes to get it calibrated. 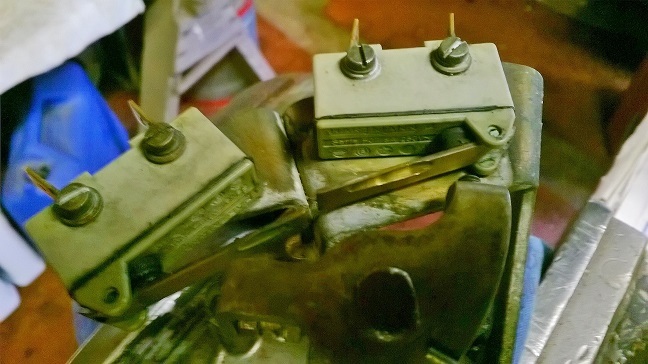 As a heads up, the idle rest screw can disrupt the microswitch calibration and operation, so be aware of that when you go to adjusting things. It still doesn't explain why it's running lean. Chatted with Goldwolf as our issues are similar. Thought on it for a bit and went through the post rebuild steps. Timing and mixture are all that caught my eye. 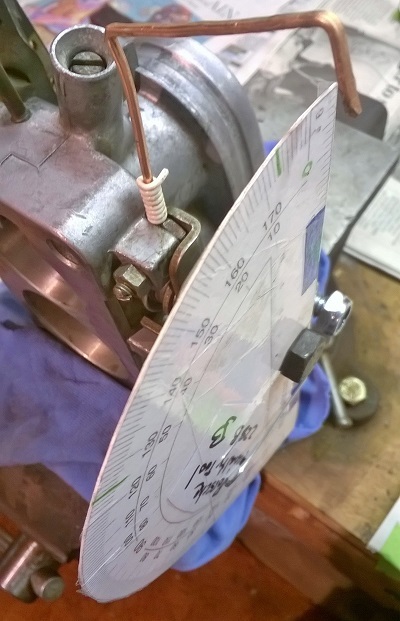 Can't set mixture according to the shop manual without proper timing, so I started there.The head and distro timing match up perfectly, however, the timing mark on the fly wheel is not on zero when the head is at TDC! I rotated the crank to the zero line on the flywheel and it's out of sync with the head/distro by exactly one belt tooth. Guessing the belt slipped by a tooth when we installed it or the engine wasn't at perfect TDC when the head was removed for reconditioning. Explains why it runs like a golf cart, is lean, and seems to be causing excess valve heat. That's nice work with that protractor . Seriously though. I got the timing belt sorted out and prepared to fine tune the timing, idle, and mixture. 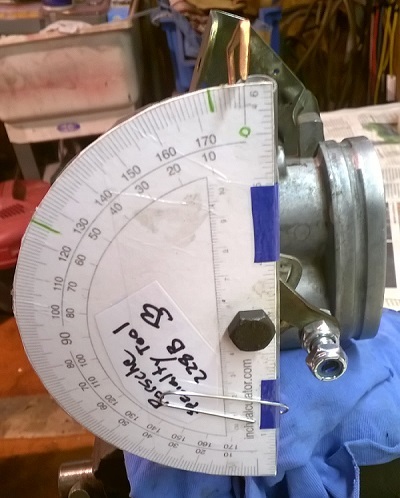 Painted a 0 deg line on the flywheel; it's horrible trying to get the timing perfect otherwise. I'm back in the shop; had to take a break from chemicals after getting poisoned and the dentist nearly killing me last year. Still not 100%, but ornery and back at it again. Had a three family members pass in 12 hours a few weeks ago, more health stuff in the family, and I'm drowning in vehicles that need fixed/sold. Oil seal successfully replaced - Victor Reinz seal. I have it timed and the CIS tuned spot on as far as I can tell without an expensive CO2 measuring device. The head for the '79 car is almost done at the machine shop; warp free, cleaned, and replaced the exhaust guides - otherwise excellent condition with heaps of miles on it! The aftermarket water pump is rubbish, apparently it doesn't have enough of a bump on the lower tube so the clamp can act like a stop. When the thermostat opens it tries to push it off and fluid starts spraying out the top volcano style. It's a NAPA part. Anyone else run into this? Now that the engine doesn't have a massive head gasket leak, it's developed an oil pan leak where the gasket folds up the front. I put CD2 stop leak in (not optimal on a rebuild, I know). I'll tighten that clamp up more and check for the leak again soon. Thought I'd update everyone on how things are going and see if you had any thoughts regarding the water pump issue. Working through this rough patch. Hope everyone here on the board is doing well! All the best!